A fire that engulfed a footwear factory in the northern Philippines has killed 72 people, authorities said Thursday. 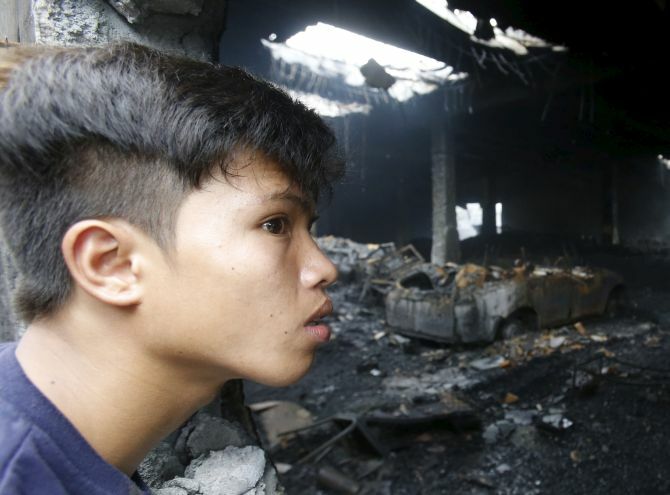 The blaze swept through a slipper and shoe factory in ValenzuelaCity on Wednesday, Mayor Rex Gatchalian told reporters at a news conference. Most of the bodies were retrieved from the gutted two-story Kentex Manufacturing Corp. rubber slipper factory a day after the fire raged for over five hours in the outskirts of the capital, Manila. As forensic officers worked to identify the dead and reconcile their names with those listed as missing, questions were being raised if the factory followed fire and building safety standards. Police will file charges against “all those accountable and those at fault,” said police Deputy Director General Leonardo Espina. Gatchalian said the fire was apparently ignited by sparks from welding work at the factory’s main entrance door, triggering an explosion of the chemicals used to make the slippers. Workers fled to the second floor where they were trapped, he said. District Fire Marshal Wilberto Rico Neil Kwan Tiu said that the building had other exits but apparently the workers were overwhelmed by the thick black smoke from the burning rubber and chemicals, which are highly flammable and caused the blaze to spread quickly.